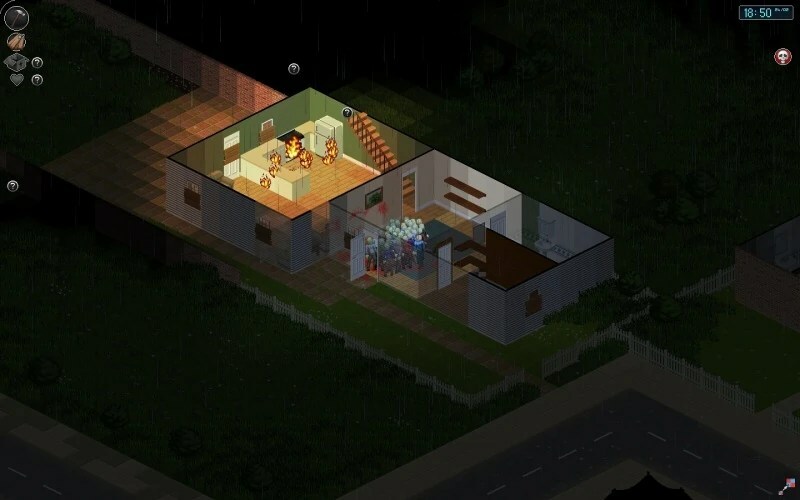 Project Zomboid offers two modes – a storyless sandbox mode in which you create your own character, and a story mode. Currently there’s only one story on offer, Till Death Us Do Part, and it functions as a basic introduction to the mechanics of the game. I fired it up. Immediately I was looking down on a scene in a bedroom, with a woman lying sprawled on the bed, bleeding, and a man standing over her. The measured dialogue between the two establishes that they’re married. They seem to have been lasting out this outbreak of zombies for quite a while, and it seems that they managed to draw the attention of other survivors, who robbed them and injured Kate in the process. Taking the role of her husband Bob you have to perform some simple tasks to ensure the continued survival of the couple. The game does a great job of using the situation to teach the player how to perform various important tasks they’ll need to survive. Kate is injured, so you need to find some bandages. A quick look in the wardrobe reveals some sheets, among the clothes and the pillows, which can be cut up into strips. Then you need to find a way to barricade the house’s entry points. The dialogue between Bob and Kate is so strongly written it makes me kind of angry at most other videogames. While giant, millions-of-dollars games have routinely struggled for countless years to make me believe in even the most broadly painted characters, I instantly believe that Bob and Kate are married, that they love each other, and that they’re dealing in a very human way with a horrifying situation. Kate apologises for messing up. Occasionally she swears as one would – out of frustration and guilt. At every moment that they were speaking I believed that these were people. And it’s really astonishing that that was accomplished with only a few lines of dialogue placed over a largely static scene. After I boarded up the house’s doors and windows I returned to Kate, and in the morning I went out to scavenge for food. I went into the house next door, opened the door to the kitchen and with a lurch of music I encountered my very first zombie. I decided it was best to avoid it entirely, for risk of infection, and I quickly found some food and left. Once I got back I re-barricaded the front door, briefly checked on Kate and went back down to the kitchen. I turned the oven on and set the food inside. Immediately Kate called from upstairs that the radio was finally working. I decided to rush up and listen with her. As the minutes raced by we heard more from the radio – mostly static, but it did give us some indication of what was going on outside. The tenderness between Bob and Kate remained, and they seemed hopeful for once – they were in a relatively safe place, Kate had stabilised, and they now had food and a means of defence. Almost at once Kate asked a question – ‘do you smell burning?’ A light went off in my head and I raced downstairs, only to find the oven alight and the fire already spreading. I watched it for a few seconds as the curtains, the wooden furniture, and eventually even the walls caught alight, and I panicked. I went upstairs again to get Kate and find a way to get her out of there. But as I reached her I knew that there was little chance of her going anywhere with those injuries. The fire was spreading, and soon I heard a another sound. I went to the windows, opened the curtains, and saw a street full of zombies attracted by the glow of the fire. Soon I heard thudding on the front door as they tried to force their way in. I stood there for a good ten seconds, deciding. I could fight my way through the slow horde, but I knew there was no way I could drag Kate with me. Flames rose up from the floorboards, and as I stood there I genuinely, as the player, came to this decision – I couldn’t leave her. The game had done such a good job of establishing their characters, and the bond between Kate and Bob, that I couldn’t simply leave Kate to die. So I did the only thing it felt possible for me to do, and I stayed there with her. I paced back and forth, waiting for the moment, and I kept thinking about how I didn’t want her to suffer when she went. I don’t know exactly how I came to it, but I remembered the contents of the wardrobe. I picked up the pillow within, then went to Kate, lying there in the bed. I went to place it over her face, to end her life quickly before she burned to death, but as I did so the horror of the situation registered in her eyes. She panicked, and I thought she was going to argue, or scream at me in betrayal. But immediately she said the following: ‘I’m sorry I slowed you down. I love you.’ I did it then, but I was left with the knowledge that, there at the end, she thought she was just slowing me down, and that I was doing it so that I could move on by myself. And in that knowledge I decided again for a final time not to leave. 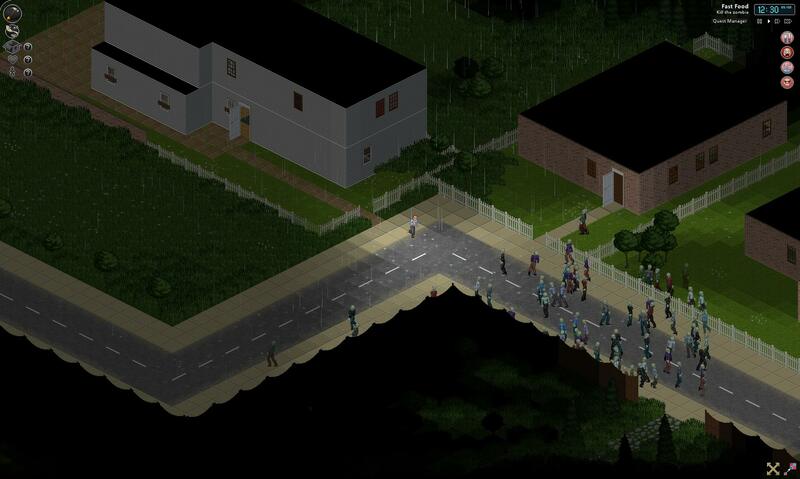 This entry was posted in Games Blather and tagged manfully shedding tears, Project Zomboid, The Indie Stone. Bookmark the permalink.